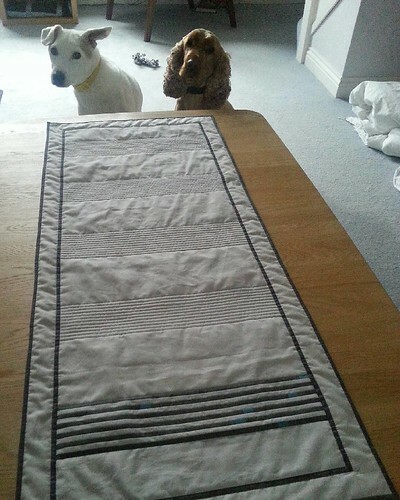 I decided that I'd make a mat for my sewing machine to sit on when it's on the table, as it's a bit awkward to push away from/pull towards me when I'm working. 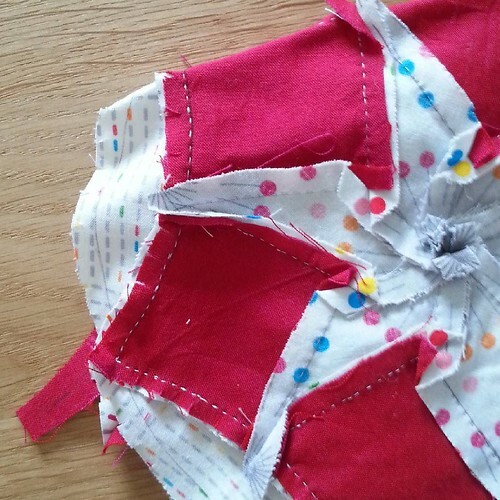 And it would be a handy place to stick the odd pin or place a reel of thread on and not have it roll off the edge of the table. As you can see, there's not an awful lot left, particularly not in large pieces, so I decided to add some bright pink solid (to reflect the pink trim on the inside of the trug and the pink quilting and pandas on the pouch) and the remnants of orange sketch I had left from making the Lola pouch. 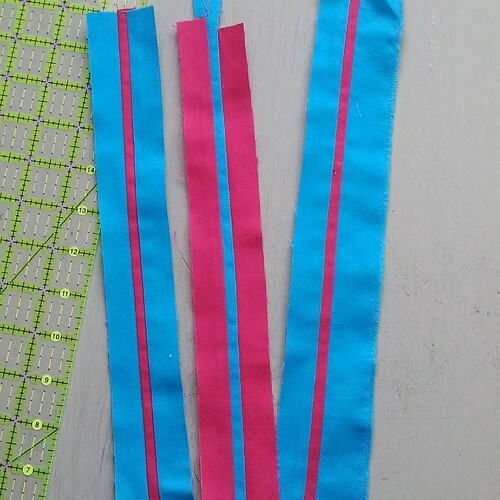 As I'd recently published my 2016 FAL tutorial for adding accurate narrow strips, I decided to use that technique to make some pink/turquoise strips for insertion, which would bulk out the pieces and make it a bit more interesting to look at/make. 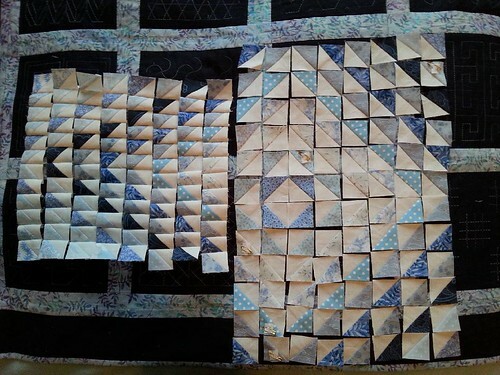 It looked a lot better once all 142 ends were darned in and I'd trimmed the excess wadding! 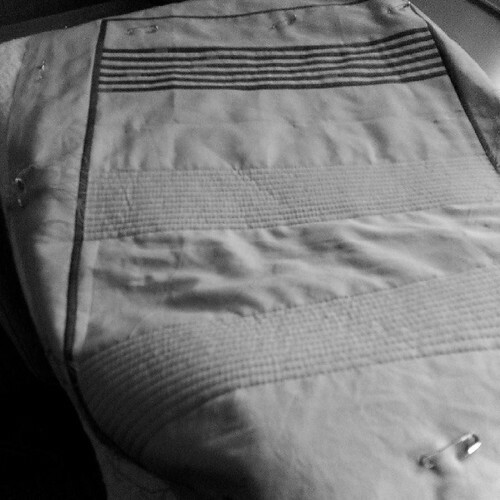 Then there was just the binding left to do. I decided that it needed some orange inserted in it to give it some balance and brightness on that side, and had just enough left! All that was left to do then was decide which way up it went for the photo! 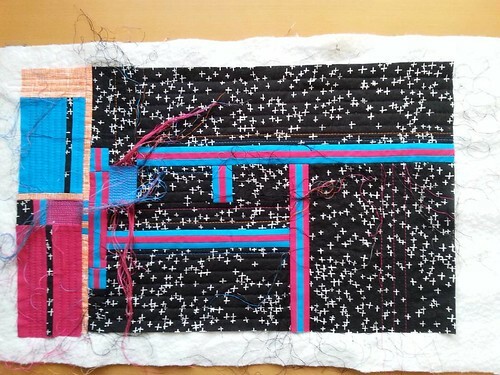 It measures 11" x 18" (yeah!) and is the perfect size for under my machine. 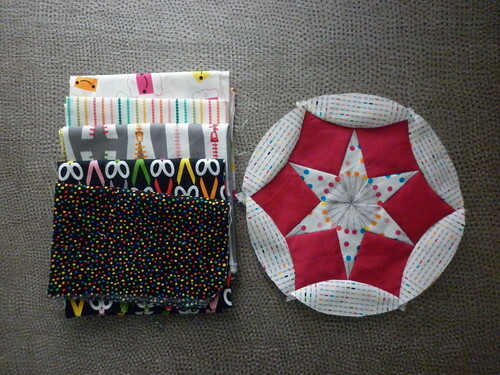 And, best of all, I made it all from scraps, including the wadding! As it's the end of the quarter, it's time to link up to the 2017 Q1 Finish-Along finishes link up. My Q1 FAL list can be found here and this post is about item 19. It's lovely that the weather is starting to be nice enough for me to come and visit my favourite wall. And isn't it nice of me to share it with Eddie? 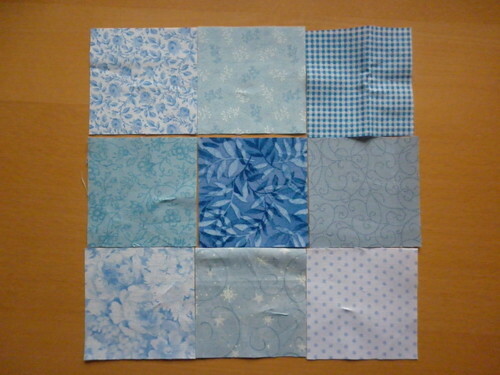 I decided to stick with the fabrics from Monico Solorio-Snow's Sew Yummy collection for Cloud 9 fabrics, so out went that multi dot and in came some tomato pin cushions. 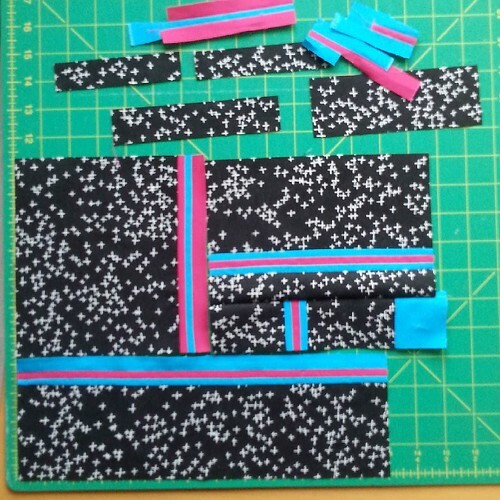 I made an exception for the bead lines second down as that would make an ideal binding. 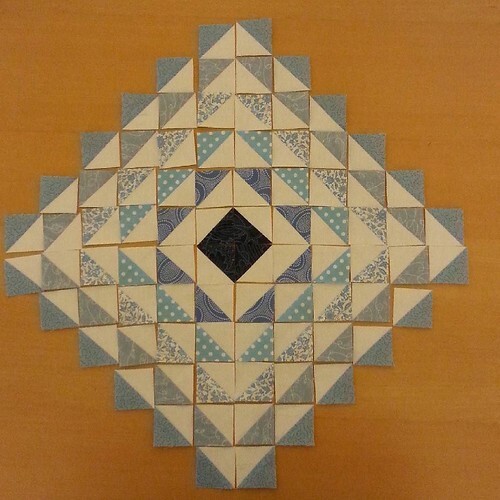 I pieced these blocks in fits and starts in between other projects as I found that having made sixteen whole blocks and four half blocks, my enthusiasm was somewhat lacking. 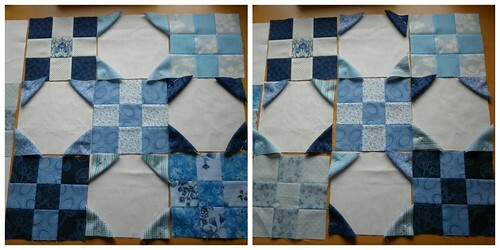 To think that when I made the test block I thought I might up the size a bit and make a big quilt! I think not! 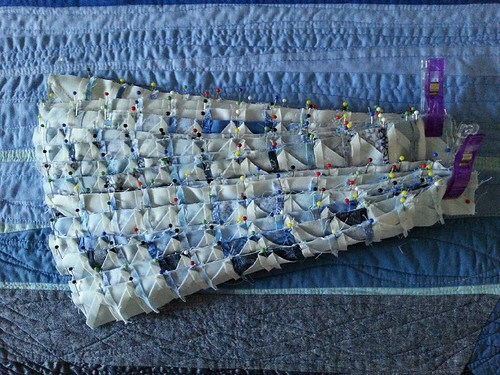 As you can see, I kept the quilting simple and just went straight through each orange peel segment in white 50wt thread. It's now pinned to my sewing room wall (you can just see the clear push pins in each corner) and I'm really rather pleased with it! As it's the end of the first quarter, it's time to link up to the Finish-Along. My Q1 FAL list can be found here and this post is about item fifteen. 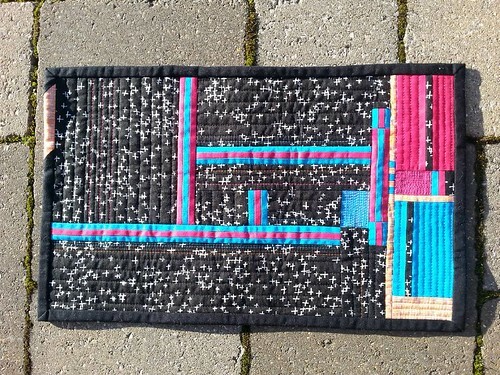 I spent a while puzzling how to quilt it until I took it to show a friend and we puzzled together and eventually decided that echoing the strips down the length of the runner would look quite nice. 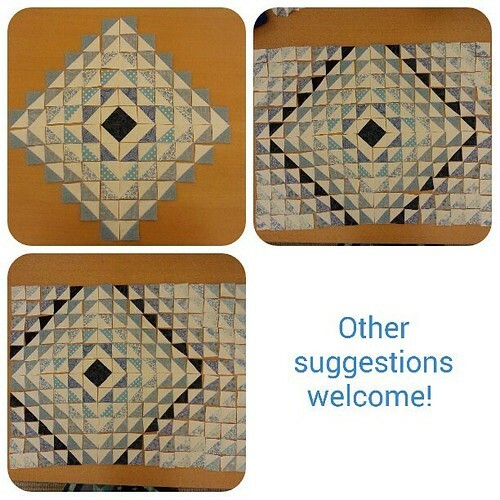 I measured the width of the inserted section (11 x 0.25" = 2.75") so I knew how wide each quilted section needed to be, looked at the runner and decided how many sections I wanted (four), and then took four lots of 2.75" away from the length of the central section to give me the distance between each section. (Still with me?!) 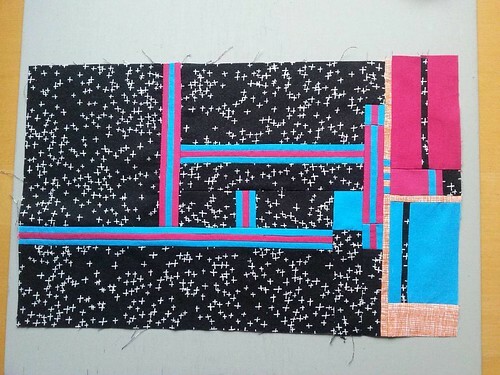 I then marked either edge of each section with a hera marker and got quilting, using the quarter inch mark on my walking foot as a guide for the bits in between the marked lines. 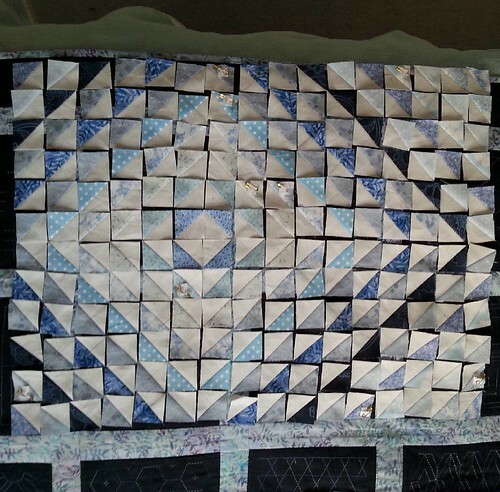 As well as quilting the sections, I quilted in the ditch along the outer edges of the inserted section and either side of the narrow border (you can just see it in the photo above). I'll be honest, I didn't like it at first! 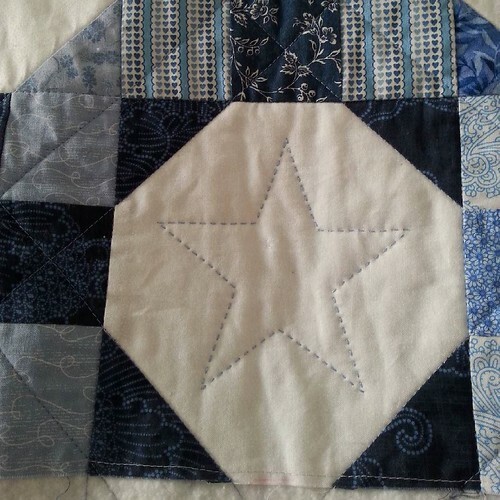 I think it was partly because I loved it so much as a flat piece of fabric that seeing the quilting took some getting used to and I felt that the unquilted bits were a bit stark. 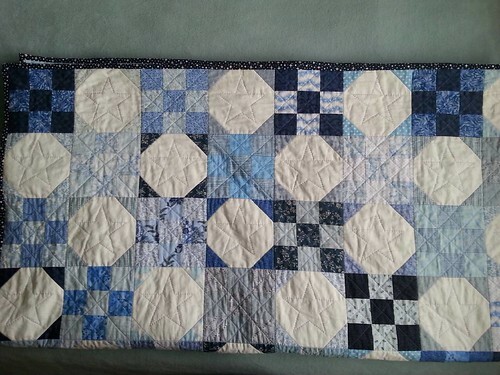 I almost threw it in the wash to get it crinkled, but decided I needed to live with it first as you can't uncrinkle a quilt. At the moment, I like it a lot more and it is currently uncrinkled. 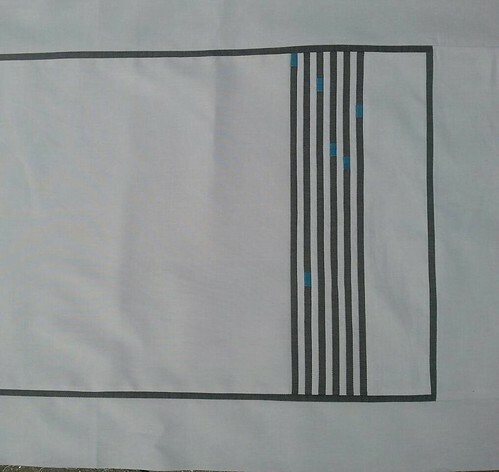 Of course, it will need washing at some point and it will crinkle (it'll probably need blocking to make sure it still lays flat after washing), and that's fine, but at least I gave uncrinkled a chance! 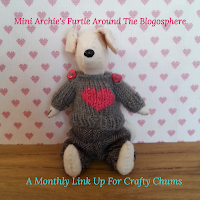 As it's the end of the quarter, I'm linking up to the Finish-Along finishes link. 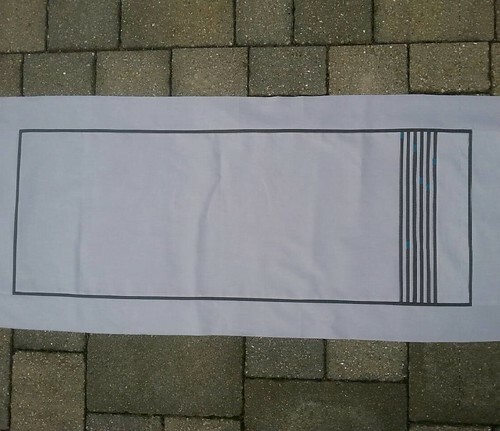 My Q1 FAL list can be found here and this post is about item 18. 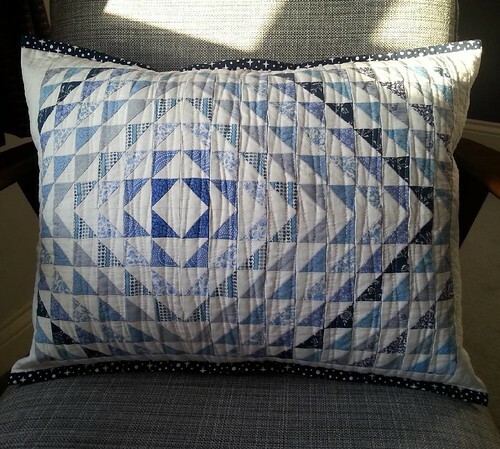 Following on from yesterday's post about the blue and white quilt, today's post is about the two cushions I made to go with the quilt, which were made from the 'bonus' HSTs created when I made the snowball blocks (although I'm not sure 'bonus' and '508 1" HSTs' should be seen in the same sentence). 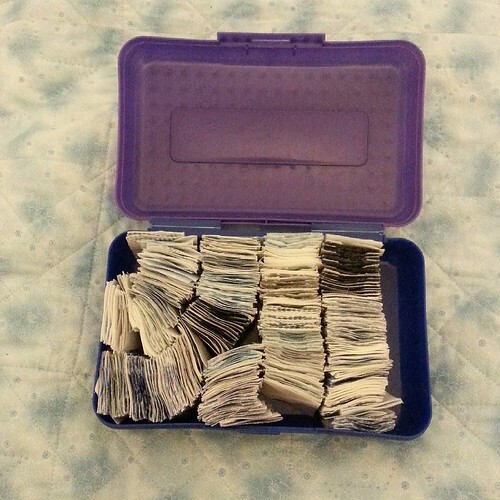 Back in August 2015, while I watched many episodes of something on DVD (I know not what, I suspect I've blanked it out in order to blank out the reason I was watching them, namely...), I set the seams on, and then pressed open, 508 HST units. 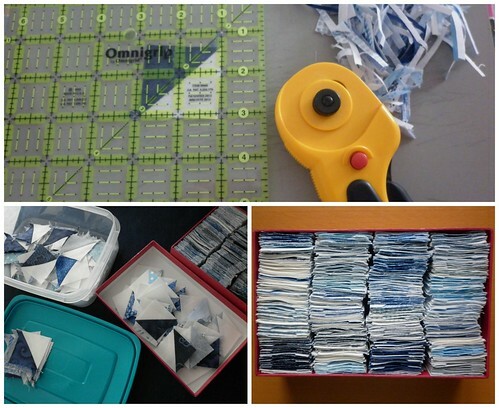 They then needed trimming to a uniform size (1.5" square), which I did over many (many!) 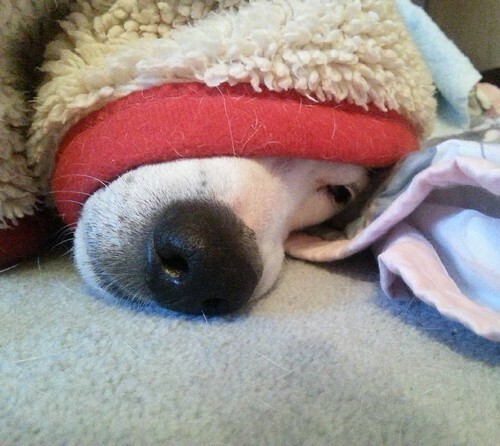 evenings while watching telly. I had a nice little system sorted with a mini cutting board on an old Next catalogue on my knee, a box for the trimmed units on one side of me, and a box for the trimmings on the other. 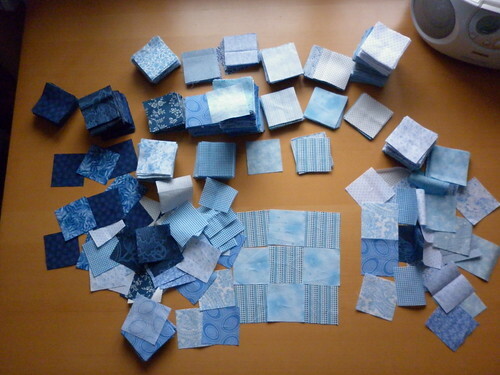 Believe me, trimming that many squares is as boring as it sounds, but waste not, want not! Don't know why that photo's so poor, sorry! Playing with 508 HST units is less fun than you'd think, which is why I combined two designs into one in the centre photo! 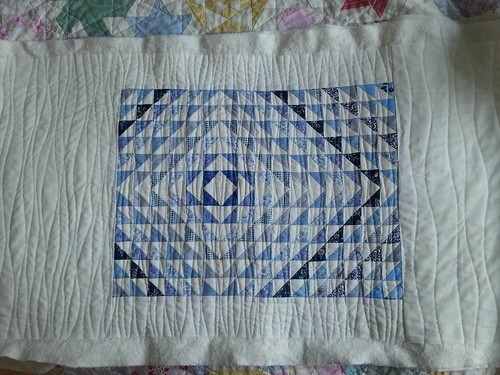 I knew I wanted to make two rectangular cushions to go with the quilt, I just didn't know what they were going to look like (I preferred the centre design, even back then). Or how I'd face piecing all the units! 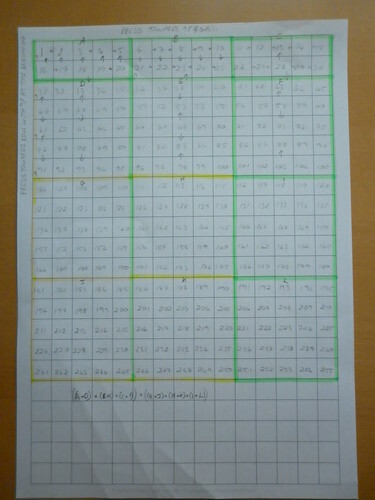 With that, I drew a plan of the panel and counted how many units were needed for each round (yes, really! 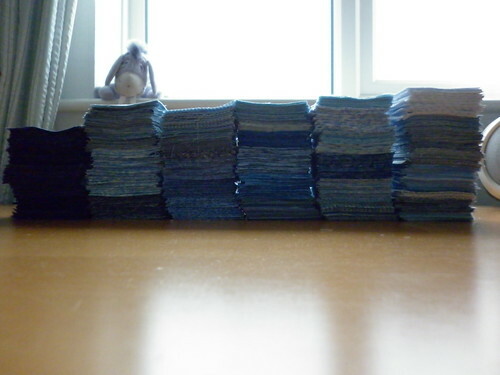 ), which was a lot less tiring than doing it by trial and error with the units themselves. 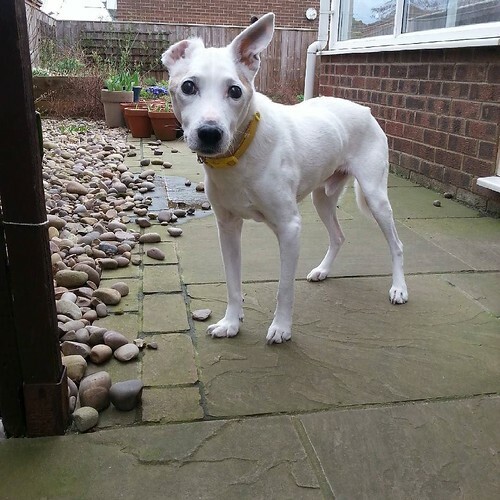 For a start, I could sit on the settee and do it rather than stooping over my bed! 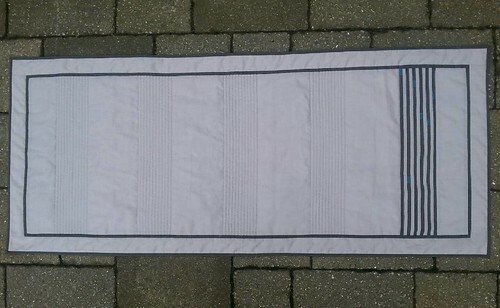 The photo is slightly misleading because I used Aurifil 2600 (dove grey) to piece them, not the white (2024) shown in the photo, that's there for scale. And because the pale grey was still on my machine! 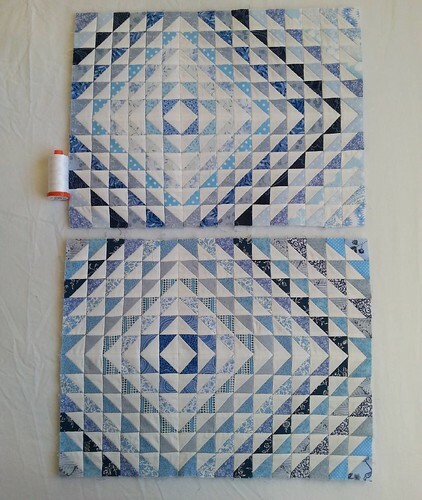 You can see that the left-hand side of the top panel and the right-hand side of the lower panel aren't quilted as densely at this point. 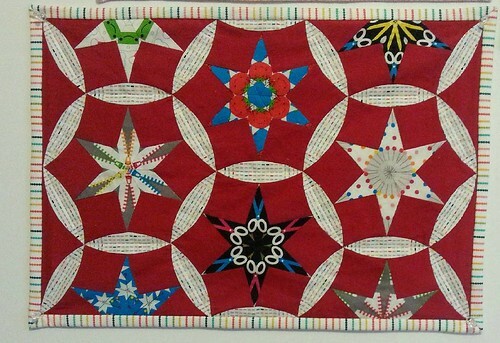 I'll be honest and tell you that the quilting started out, well, terribly. 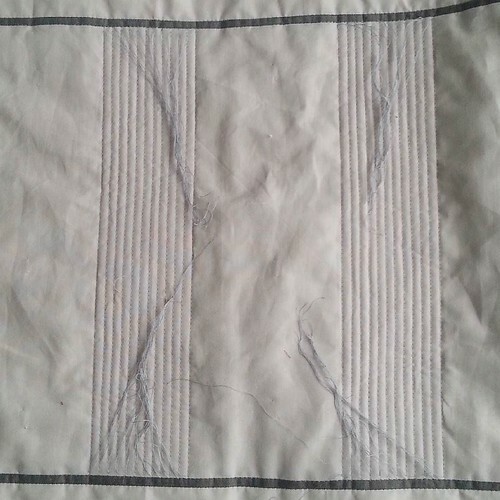 I started with these wavy lines, hated them, unpicked them, did straight lines, hated them, redid the wavy lines, hated them...and then remembered that wavy lines always look dreadful when you start and that they only start to look better as you do more of them, something to do with them looking shonky when sparse, but deliberate and textured when denser. So I ploughed on, and I'm glad I did!! 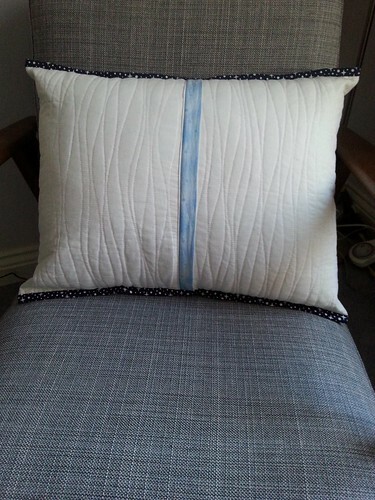 My Q1 FAL list can be found here and this post is about item three, one of the pair of blue and white HST cushions. 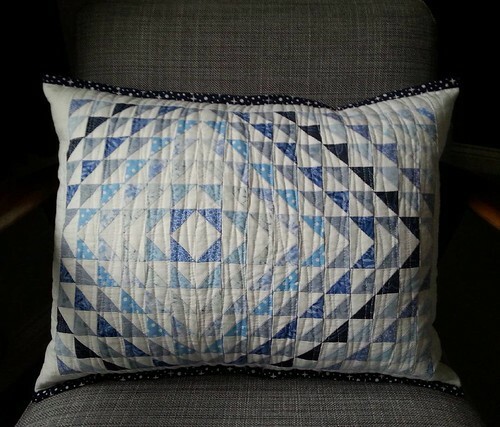 I'm linking the first finished cushion up with this post (the one with the slightly lighter centre) and will link the other up with instagram. 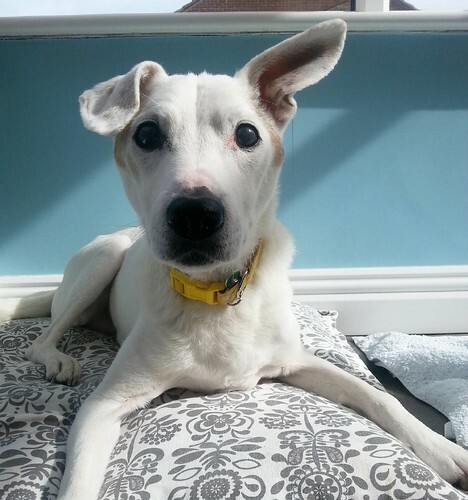 I told you: no photos with my ear inside out! 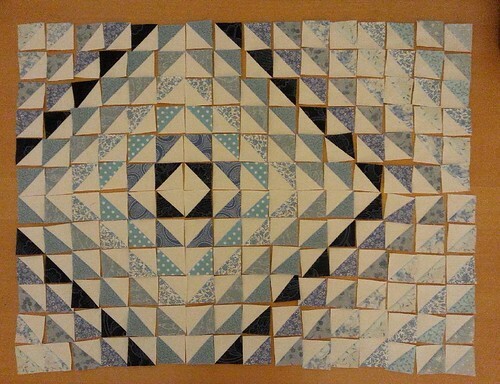 The Blue And White Blighter - A Finish!!! Today the Q1 finishes link opens for the 2017 Finish-Along and I thought it was high time I started catching up on blogging about my (sort of) recent finishes. 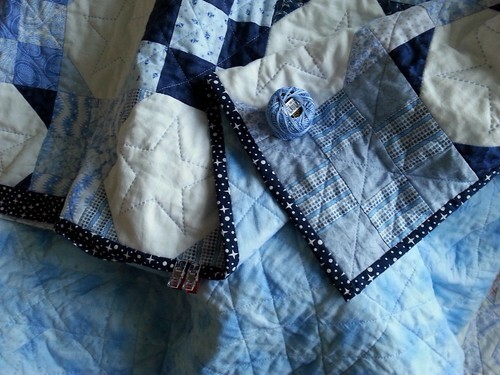 My Q1 FAL list can be found here, and this blog is all about item one, the big blue and white quilt. 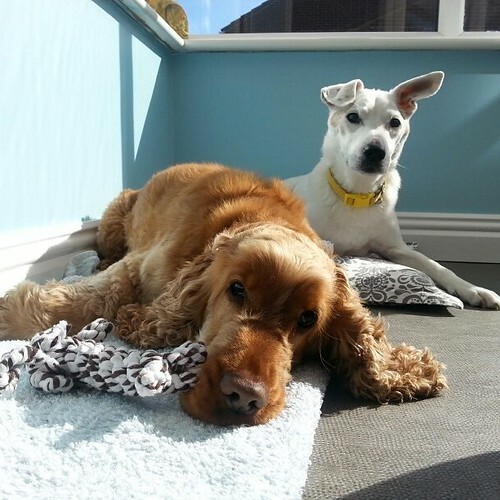 I started the quarter in my usual manner: like a greyhound out of the traps. I then continued in my usual manner: having a lie down about quarter of the way round. 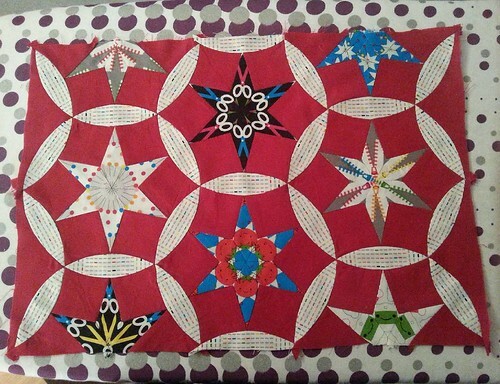 This time, it was more pronounced because I wanted this quilt finished in time for my mam's birthday in early January. 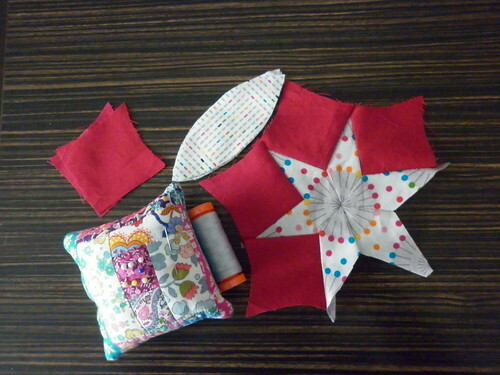 I don't know what that ball of perle is doing there, I certainly didn't use it to sew down the binding! 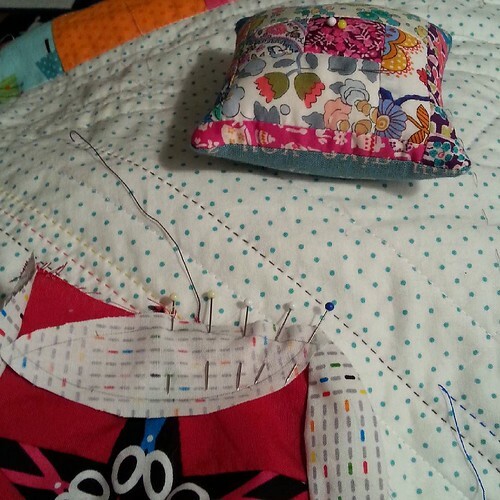 and I just needed to sew down the binding to the back. 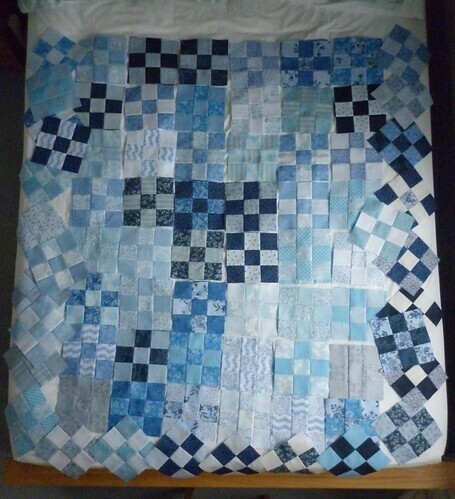 I started this project in March 2012, but it had been in the planning since August 2011 when Mam and I visited a local show and started collecting fabrics for it (it's harder than you'd think to find fabrics with only blue and white in them) and planning the size, etc. It first appeared on my FAL list in Q2 2013, when Leanne was the host. 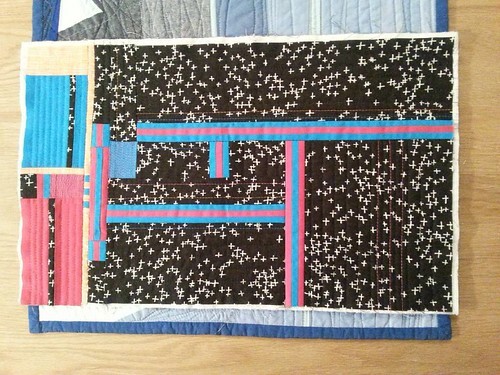 I didn't strip piece because I wanted each nine patch to be different. Things would have been easier and faster if I hadn't! 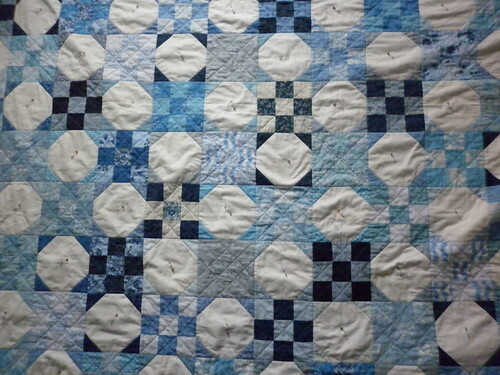 When I started piecing the blocks together, I discovered that very careful pinning was required to get two nice snowball points meeting two nine patch seams. This came as quite a blow and slowed me down considerably. 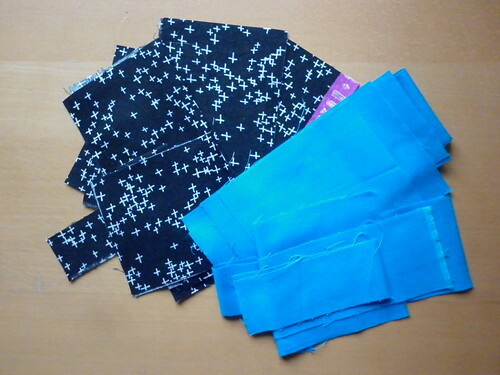 I also discovered that pinning and sewing these seams was really, really tedious. This slowed me down even further. At several points along the way, I doubted I'd ever finish it. In fact, if it had been for me, it would still be in pieces! So big that the only way to get it all in the frame is to lay it on Mam's front and hang out of her bedroom window! She wasn't impressed when I said she had to stay out there and guard it in case of a strong gust of wind! 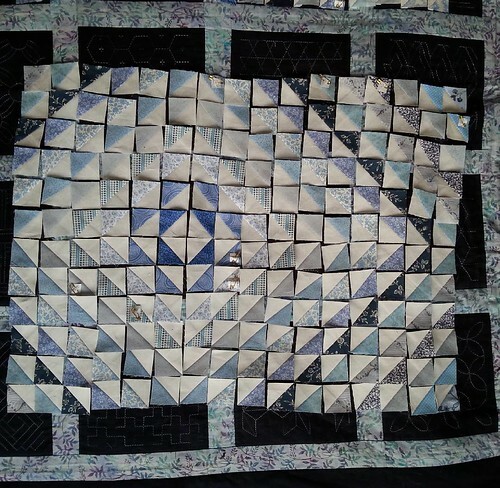 I layered and pinned it, after moving every piece of furniture in my front room to accommodate it, and started the process of stuffing it through the machine machine quilting. 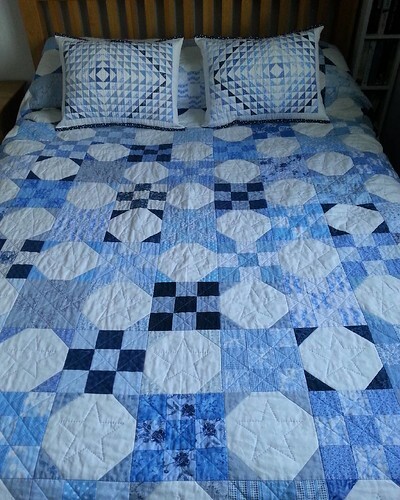 Well worth the additional hours of quilting! 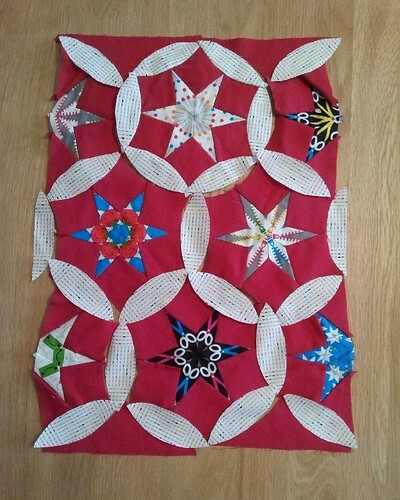 After several weeks of doing only this (and having a target of fourteen stars a week), I was ready to trim it and add the binding. 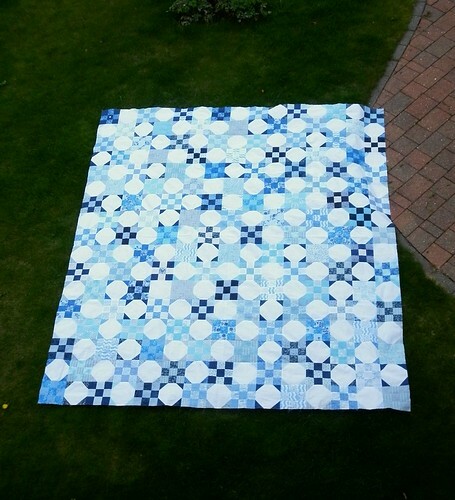 I finished about a week before Mam's birthday and am pleased to say she was thrilled with it! 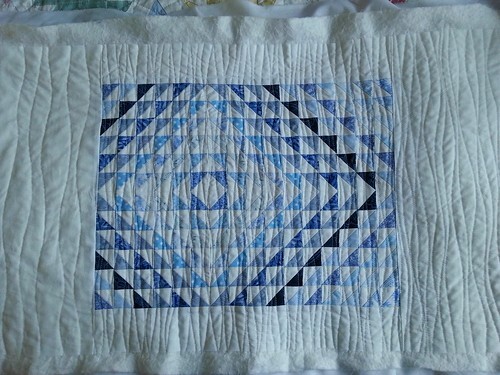 I'll share a photo of it on the bed in my next post, along with a couple of co-ordinating finishes. Size - 90" x 112"
And here's another photo of the finish (same as the one at the start), just in case you've forgotten what it looks like after all that! Finished? After all this time?! This calls for tuna!